A mix of new and familiar faces showed up at the Hudson and Holland Scholars Program’s open house Thursday afternoon. Prospective IU students, IU Bloomington freshmen, returning students, and campus partners mingled and enjoyed refreshments in the program’s bright new space on the third floor of the Admissions Building, 300 N. Jordan Ave.
One of those prospective students was Elena Herrera, a senior at Bloomington North High School. The thing that I really like about it is you already have an immediate family. You have people to turn to, no matter what, and it’s nice to have people to go to when you feel kind of lost in the sea of people at IU. 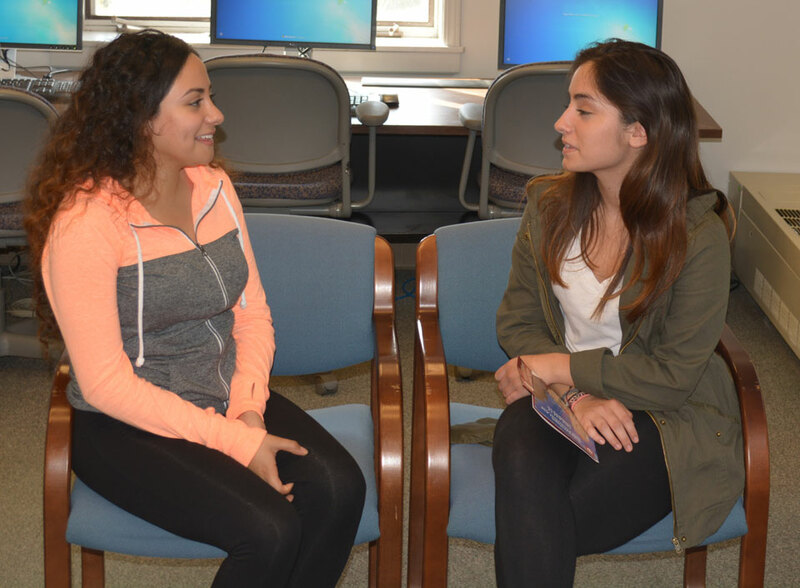 Chatting with her about Hudson and Holland was IU sophomore Erika Ramos, who jokingly admitted that she’d been “bothering” Herrera about the program’s benefits. “It’s just a great support system. I established a friendship with my adviser, Mimi [Dr. Miriam Attennoukon, Ph.D., the program’s STEM coordinator], and Rachel [Boveja], another one of the advisers. Mimi has guided me through troubles with classes and now that I’m considering changing my major, she’s been really helpful with that. If I’m ever struggling, I know that Mimi’s here and she’s going to do whatever she can to help me,” explained Ramos, an Indianapolis native. IU freshman Kenlynn Albright is new to the program, so she wanted explore the new digs while taking advantage of the refreshments. That’s exactly what McGriff is aiming for. “The campus is putting a lot of resources behind Hudson and Holland to make sure that prospective students and current students can see that they can be supported and loved on this campus. We keep lots of refreshments in the student room. We have computers, a printer, a whiteboard, and everything they might need to be comfortable. My office is right next door, so I’m never inaccessible,” said McGriff.